Dr. John Ward is a research scientist at the Mekong Region Futures Institute specializing in integrated natural resource management. He spoke with VOA’s Neou Vannarin about the future of the Mekong, the effects of climate change, hydropower development, and the impact on the environment and people of the region. BANGKOK — Editor’s Note: Dr. John Ward is a research scientist at the Mekong Region Futures Institute specializing in integrated natural resource management. He spoke with VOA’s Neou Vannarin about the future of the Mekong, the effects of climate change, hydropower development, and the impact on the environment and people of the region. VOA: So, Based on your experience, what are the main problems for the Mekong river as a whole? JW: I think that the most important question with any river system is how much is society prepared to modify the Mekong system? And by modify I mean building dams, how much to take away and how much water is required to maintain the river as a functioning system. This is really something we haven’t looked at very carefully. Then we have different societies, we have Cambodian society and the Chinese society, Laos society. They need to discuss within those countries what’s needed to be resolved on this and how much to modify the system. At the moment, it is very much an ad hoc process. There is perhaps some planning within countries but there is very little planning within countries and between countries. So that’s where this trans-boundary problem starts to arise, and what we are seeing now is that with the very latest severe El Nino, those problems have become accelerated, exacerbated and much more amplified, and we have to see those, for example, as with the Tonle Sap and also Thailand. with the most severe drought that we experienced. And what sort of happens is that it’s going beyond the adaptive capacity of countries to manage this, particularly with small farmers, rural households. It exceeded their capacity to manage this process. That, to me, is the problem. We don’t have those arrangements to actually coordinate between countries and within countries. 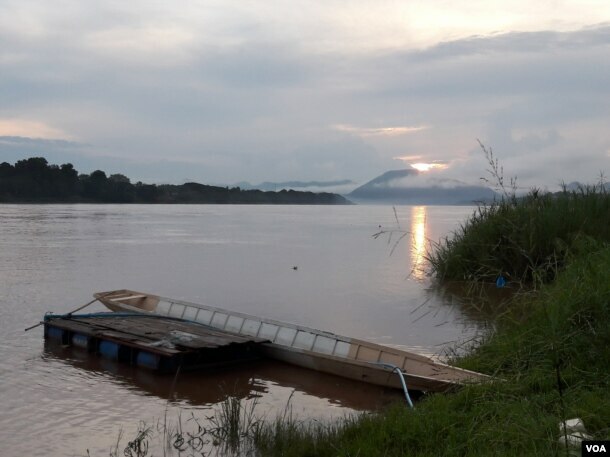 VOA: Do you think water diversion projects will have negative effects across the Mekong region? JW: It’s gonna change. It’s very dependent on where people are located and what they are doing on the Mekong river. Really, for a very long time, the Mekong was a relatively unmodified system. There was nothing like irrigation, particularly upstream. There weren’t a lot of dams. It’s been very rapid development. All of the sudden, very rapidly they have to manage a hardly developed river system. At the moment the institutions aren’t capable of managing that very well. So up to now, we have essentially a voluntary arrangement where countries manage the river according to the [Mekong River Commission] 1995 Agreement, which is okay for a while. But now, we start to see bilateral arrangements starting to come out, which go beyond the MRC agreement, it would seem. And the institution that we have, the legal system, the legal framework, both between countries and within countries, isn’t sufficient to manage this very rapid mobilization and development of resources. This is really the problem that we have to address at the moment. The MRC has done a very good job as a technical advisory body. But it has never the executive power, it’s never had the capacity to enforce or to manage whatever happen to the river. VOA: Do you think the MRC has worked? JW: At the moment, there are unilateral decisions and also some bilateral arrangements and agreements, which seem to be starting to occur. Previous to that, the MRC agreement would have prime notification and some consultation would have been required. Now, the Laos government insists that they went through that process. Similarly with the Thai [government] with the water diversion. Their argument is that it doesn’t actually require prime notification. So I think there has been a different interpretation as to what the MRC agreement was about. And the non-defined agreement allows the different interpretations to occur because there is no rights sanctions or enforcement or rights to veto. There is no organizing body to manage the whole MRC agreement. VOA: What are the major problems with the MRC? JW: Countries down the Mekong, they want to develop their economy . They want to go from least developed country status to developed country status. And the Mekong water resource is seen as a vital part in achieving that, whether it’s industry or agriculture. But of course the environment has a legitimate claim as being one of the uses of the river. So it’s a dependent ecosystem and so forth. They also have a right to claim the water of the Mekong. And, unfortunately, the environment does not have a voice at the moment, or at least it has a very quiet voice. So as far as all this process goes. We have all these competing interests, competing requirement of the countries as to how the Mekong is used. But the environment is already one part and has a very quiet voice in how the Mekong is utilized. When we talk about some of the rights of the river, the environment also has the right to the water of the river. And that hasn’t been negotiated very well at all. VOA: Should Mekong Subregion countries learn from other countries? JW: Absolutely, yes. Other countries have gone through this. They have gone through a relatively unmodified river system to a highly developed one. And there are lots of lessons to learn from that. In other words, how to avoid all the problems in the first place. It’s very difficult once you have a very developed system, for example, how do you get rid of the dam? What has the dam been doing? It’s very difficult to get rid of it. So better to avoid the problems in the first place. Certainly in the US, in Europe, in Asia and Australia, there are a lot of examples where they have trans-boundary problems like the Mekong and lots of lessons to be learned. How to avoid the problems in the first place. VOA: There are a lot of claims that mega projects like the Thai water diversion project and the Xayaburi dam in Laos will benefit only the rich. What is your view on that? JW: I have heard these claims. This is commonly articulated. We don’t know enough about the program of the diversion, of where it’s going to go at this stage to make any sort of claim about that. In other words, there’s not enough information to make an impartial judgment. This is from a scientific perspective. We don’t have enough information simply to say who will benefit or who won’t benefit. Having access to that information, that would be very useful. VOA: What should Mekong countries do in terms of policy and strategy? This piece was produced in collaboration with The Mekong Eye and Mekong Matters Journalism Network through a field workshop for journalists. The journalist and their outlet retain full editorial and copyright control.